Thursdays will be simple fare because it’s a setup and work day. Food has to be easily grabbed so it’s usually cold cuts, a cold salad like tuna, chicken or egg, fresh salads and fruit. 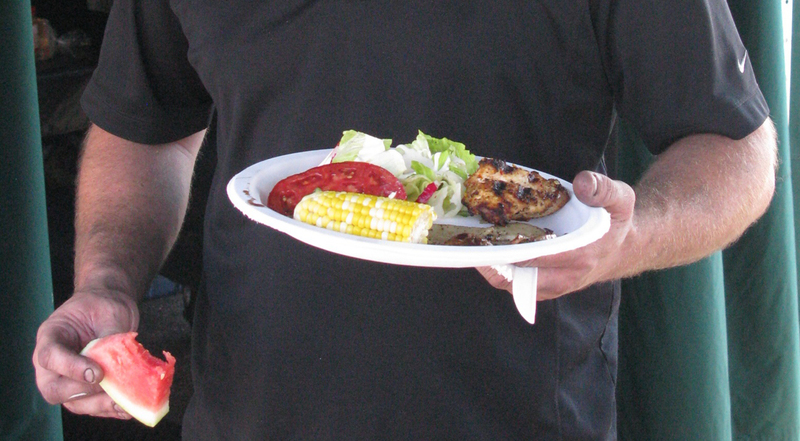 Fridays will include one or two meals and the menu depends on the schedule and how much time the guys have to eat. Saturdays Jonny makes one meal that is good and hearty. Sundays include a big breakfast that the crew counts on and lunch. Menus vary greatly as Chef Jonny tries to cater to the region the team is in. For instance, in the South, he might fix grits. He also takes suggestions from the crew. Everything is made from scratch. He even bakes – brownies, corn bread, meatloaf, prime rib. As he talked to me last week, he was preparing pulled pork. It had been marinated overnight (and even the raw meat smelled heavenly), and he was putting it in packages to start the slow cook on the grill. Check out this video of him preparing a meal during the test session that featured chicken below: [youtube]http://www.youtube.com/watch?v=CbpCjMCTD_0&list=UU8x_r855M4mdwKchMOG5J1w&index=4&feature=plcp[/youtube] The team can count on him to always have snacks and lots of fresh fruit and salads that they graze on all day long. “I make a lot of stuff I don’t think that they’ll eat,” Jonny says with a sly grin. “I’m trying to expand their food experiences. If it’s something weird, I won’t tell anybody what it is. Like the Brussels sprouts I served last week. I sliced them up and sautéed them with butter and garlic and a little white wine. They didn’t know what it was, but they said, ‘Hey, this is really good. What is it?’” So what do some of team members think about his cooking? Check out these short videos below to find out: [youtube]http://www.youtube.com/watch?v=PCsAauG_A1M&list=UU8x_r855M4mdwKchMOG5J1w&index=3&feature=plcp[/youtube] [youtube]http://www.youtube.com/watch?v=Nq3p8exCdRg&list=UU8x_r855M4mdwKchMOG5J1w&index=2&feature=plcp[/youtube] [youtube]http://www.youtube.com/watch?v=5_8zJqHuHIs&list=UU8x_r855M4mdwKchMOG5J1w&index=1&feature=plcp[/youtube] Life on the road Days are really long for this chef who said he averages a minimum of 11 hours and up to 16 hours. On Fridays and Saturdays, he starts about 6 a.m., and Sundays he starts about 4:30 a.m. to prepare that massive breakfast. 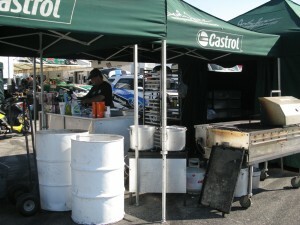 There are some pitfalls to having a mobile outdoor kitchen. One time at Bristol, Jonny was pouring boiling water from a pot of cooked potatoes into a colander to drain. As he poured it into a grassy area, he tripped on the curb and splashed the hot water all over his face and body. “I work more at this job than when I owned restaurants – and I didn’t think that was possible,” he said. But it’s not all grind and toil. He is very gratified a lot of the time because of the guys and the friendships. It can even get emotional. Recently one of the John Force Racing team employees in California experienced a medical emergency and was not doing well. With damp eyes, Jonny asked to remember his longtime friend. 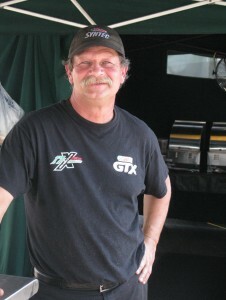 With a simple, “God bless Sharon Brooks” Jonny summed up what it means to be a member of a racing organization like JFR. It becomes like family and he contributes the best he has to give - good, nourishing and tasty food. 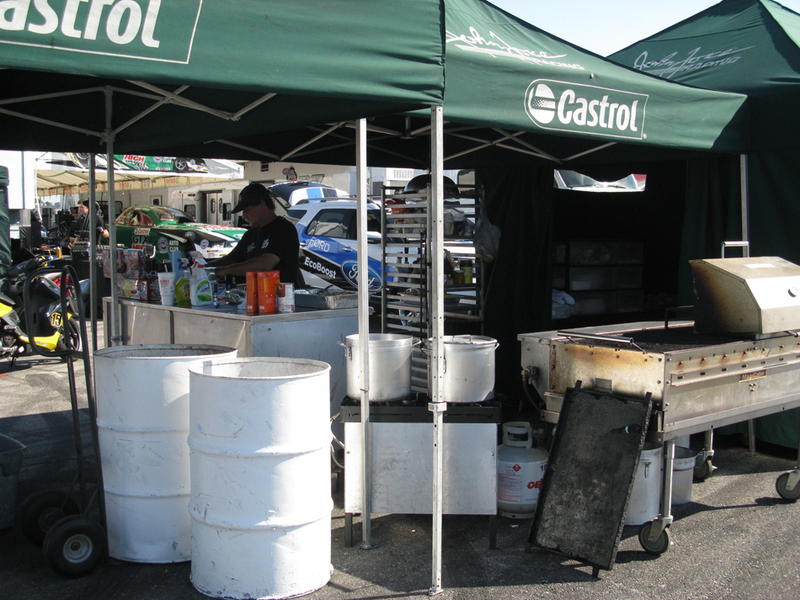 “My thing,” Jonny says, “is I always say I want to do championship food for a championship team.” Make sure you say hello to Jonny and all the crew members for every team back in the pits this weekend during the Mac Tools U.S. Nationals at Lucas Oil Raceway in Brownsburg, Ind.